Created by Why Not Theatre, The RISER Project is a new initiative that pairs established companies with emerging artists to share resources and make producing indie theatre just a little bit easier. The inaugural RISER season is taking place at The Theatre Centre with two shows currently on stage (closing May 3rd) and another two soon to premiere (on May 13th). This gorgeous marriage of physical theatre, music and storytelling has the confessional intimacy of a solo show with the enlightening twist of two performers to capture the many complexities of its single character. 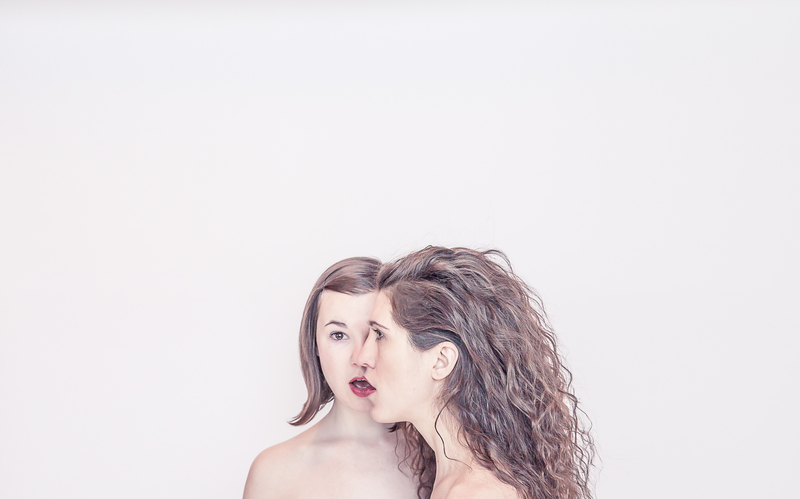 Creator/performers Norah Sadava and Amy Nostbakken are equally entrancing but almost opposite in demeanour, creating a strong push-pull dynamic even as they work in perfect synchronicity (or literal harmony as they hauntingly perform Nostbakken’s atmospheric original compositions). At its heart, Mouthpiece is a character portrait but its hyper-focus on a single woman’s experience of the world allows the playwrights to explore larger themes of femininity, conformity, rebellion and identity without reductive generalizations. A deceptively simple revelation about a daughter’s relationship to french fries as it relates to her mother’s relationship to french fries is one of the most incisive comments about contemporary womanhood that I’ve ever heard. An anecdote concerning the practice of wearing control-top pantyhose under skinny jeans and a leather jacket follows close behind. The hour-long piece gets occasionally lost in its own thoughts but it provides such a beautiful mix of lasting imagery (Sadava curled up in a womb-shaped bathtub as she tells of shopping for her mother’s coffin is particularly visceral) with relatable human insight that it’s hard to blame Sadava and Nostbakken for the occasional meandering moment. If nothing else, you can use those moments to wrap your mind around the rest. Save a few confounding surrealist moments at the end, playwright Daniel Karasik’s tense and engaging new work Little Death is mostly (and somewhat refreshingly) straightforward in its storytelling but thankfully not in its emotions or moral limitations. Some serious casting coups give this indie work impressive heft, showcasing the nuance of Karasik’s text and carefully keeping his potentially alienating characters on the right side of redeemable. Jenna McCutchen’s set design is fairly limiting but director Zachary Florence smartly harnesses said limitations by literalizing the emotional space between Christopher Stanton’s fragile Alex and Nicole Underhay, glorious as his conflicted wife Brit. In contrast, he allows as little space as possible between Alex and the most intriguing of his mistresses Claire, confining the actors to one small stretch of set, intertwined with each other at all times. Second only to the much more fleshed out role of Brit, Claire is Karasik’s strongest creation, the one woman (of the many in the play) with whom we see Alex be really intimate, a reality facilitated by the low stakes of her uncomplicated sense of detachment. Played by the perpetual revelation that is Kate Hennig, Claire is a beautifully sexualized mature woman with confidence and verve to spare but whose comforting warmth comes with the resonant caveat that this connection is understood to be fleeting (Claire has a husband to go back to just as Alex, theoretically, has his wife). She’s exactly the sort of woman we need to see more of on contemporary stages and its her almost dreamily poignant presence that elevates Karasik’s domestic drama between a struggling man and his heartbreakingly optimistic wife into something far more conflicting.